When I read "Brown Sugar Bundt Cake" I thought: Hm. Dunno. Sounds not too exciting. I usually use brown sugar anyways. But then I read that the recipe calls for prunes and pears - complete change of mind! Prunes and pears are some of my favourite ingredients. 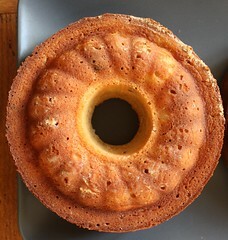 To make it short: This cake tastes wonderful and is easy in the making! I halved the recipe and still got two little children-bundts and three minis. (I use minis as "test-pieces" because I don't want to give somehting to my co-workers I have not tested before.) I made no changes to the original recipe but did cut the baking time due to the smaller mold I used. Thanks to Peggy from Pantry Revisited who has chosen this recipe for this week's TWD. Go to her page for the recipe or have a look at Dorie's book page 179. Ciao ! I think you have dono your cooking for the week ! 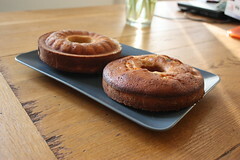 Lovely bundts ! Those are creative looking mini-bundt cakes to me! Love them. Thank you for baking with me this week and I am glad you enjoyed the cake. The frozen yogurt sounds good too!! your cakes look amazing! So glad you enjoyed them!!! Your cakes look lovely in all their different shapes, great job! I love Bundt cakes so I was looking forward to this. I made the hazelnut variation and it was so good! I couldn't wait to cut into it till the next day...I was so hungry! Oh, looks great and sounds like a fun day of baking and treats! What a great way to spend the day - baking with frineds. Love your baby bundts! You are one busy beaver!! All the little cakes look delicious! Such a great combination of flavors. I love the idea of a guerilla bakery, too! What sweet little bundt cakes! It sounds like you had a very enjoyable day!